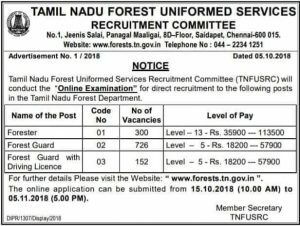 NOTIFICATION: Tamil Nadu Forest Uniformed Services Recruitment Committee (TNFUSRC), Chennai inviting online applications for filling up 1178 vacant posts of Forester, Forest Guard and Forest Guard with Driving Licence in the Tamil Nadu Forest Subordinate Service of the Tamil Nadu Forest Department from eligible and interested willing candidates. It is latest & good information for unemployed personnel those who are looking for these new Jobs in Government sector & other organizations. Job seekers, who wish to apply for these vacancies regarding TNFUSRC Recruitment 2018, must have passed Bachelor’s Degree in Science/ Higher Secondary Course with Physics, Chemistry, Biology, Zoology or Botany with a required experience if asked. Applicant’s upper age should be as per Govt. rules and age relaxation is applicable to all reserved category candidates i.e.SC/ST/ OBC /PWH /Ex Servicemen /Women candidates etc. PLACE OF POSTING: Tamil Nadu. 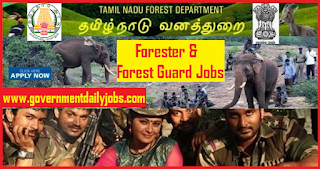 NO OF POSTS: 1178 vacant posts of Forester, Forest Guard and Forest Guard with Driving Licence in Tamil Nadu Forest Uniformed Services Recruitment Committee (TNFUSRC), Chennai. 1. Forest Guard: 726 Posts. 2. Forest Guard with Driving Licence: 152 Posts. 5. Computer Applications / Computer Science. 6. Engineering (All Engineering subjects including Agricultural Engineering). B. Forest Guard: A passed of Higher Secondary Course with Physics, Chemistry, Biology, Zoology or Botany as one of the subjects from any recognized Board/Institute. C. Forest Guard with Driving Licence: A passed of Higher Secondary Course (Plus Two) with Physics, Chemistry, Biology, Zoology or Botany as one of the subjects from any recognized Board/ Institute. Candidates must possess a valid Driving licence issued by the competent Transport Authority, a Certificate from any reputed firm or company to the effect that the candidate possesses experience in driving of Light motor vehicles/Heavy Motor Vehicles for a period of not less than 3 years after getting the driving licence, basic knowledge about the general mechanism of automobiles, first aid certificate issued by the recognized organization in Tamil Nadu. KNOWLEDGE IN TAMIL: Applicants should possess adequate knowledge in Tamil Language. 1. Forester: Level 13 – Rs. 35,900 /- to Rs. 1,13,500/-. 2. Forest Guard: Level – 5 Rs. 18,200/- to Rs.57,900/-. 3. Forest Guard with Driving Licence: Level – 5 Rs. 18,200/- to Rs.57,900/-. AGE LIMIT: Candidate’s required age should be in between of 21 years – 30 years as on 01-07-2018 for TNFUSRC Recruitment 2018 latest 1178 Forester & Forest Guard Vacancies. 1. Forester: Rs. 250/- + applicable service charges. 2. Forest Guard & Forest Guard with Driving Licence: Rs.150/- + applicable Service Charges. SC/ST/Differently Abled Persons are exempted from the payment of application fee. POST RESERVATION: All reserved category candidates ie. SC/ST/OBC/ PWD/ Women /Ex Servicemen/Widows etc (as applicable) are being selected for said post/s as per existing Govt. policy/rules. कर्मचारी चयन आयोग द्वारा हिंदी ट्रांसलेटर, जूनियर ट्रांसलेटर, सीनियर हिंदी ट्रांसलेटर और हिंदी प्राध्यापक की भर्ती हेतु विज्ञापन जारी किया गया है। इच्छुक उम्मीदवार यहाँ आवेदन कर सकते हैं। आवेदन करने से पहले पूर्ण अधिसूचना यहाँ पढ़ें – Various vacant posts of Junior Hindi Translators, Junior Translators, Senior Hindi Translator & Hindi Pradhyapak through Staff Selection Commission (SSC) New Delhi. LAST DATE TO APPLY: 19-11-2018. Based on the Online Examination, the eligible successful candidates will be called for appearing in Endurance Test, Physical Standards Verification in 1:3 ratios for final Selection. INQUIRIES: Toll free helpline number for Technical issues regarding Online registration and application - 1800 419 2929. CENTRES FOR EXAMINATION: Examinations will be held in all 32 districts of Tamil Nadu. The Tamil Nadu Forest Uniformed Services Recruitment Committee (TNFUSRC) reserves the right to modify the number of Examination Centres and to re-allot the candidates. The list of Districts for the Examination is available in the Information Brochure. HOW TO APPLY: For said posts (TNFUSRC Jobs 2018 for 1178 Forester, Forest Guard with Driving License) eligible, willing and interested candidates may apply through online at official website up to last date. Applicants must retain a hard copy for future reference. 2) Before applying, candidate should have valid email & scanned copies of photo, signature. 3) Under "Recruitment" section Select the desired post. 4) Read the information carefully & Click on "Apply Online". 5) Click on “Click here for New Registration”, if you are a new user. 6) Complete the Registration & Click on “Submit”. 7) After Registration, Log in with Registered Number & Password. 8) Fill the all details in the application & upload Photo, Signature. 9) Download the form and take printout for future reference. CONTACT ADDRESS: Tamil Nadu Forest Uniformed Services Recruitment Committee (TNFUSRC), No.1, Jeenis Road, Panagal Maaligai, 8D–Floor, Saidapet, Chennai 600015, Chennai, Tamil Nadu. CONCLUSION: Tamil Nadu Forest Uniformed Services Recruitment Committee (TNFUSRC), Chennai invites online application for the recruitment of 1178 vacant posts of Forester, Forest Guard and Forest Guard with Driving Licence on regular basis from Indian residents who are eligible & interested; candidates can apply through online application. LAST DATE TO APPLY: 05-11-2018 for TNFUSRC Recruitment 2018 for 1178 Forester and Forest Guard Jobs.